If you’ve been in a hotel, restaurant, casino, or country club, you can probably remember the person who served you. That person was either memorable as knowing how to treat you as a guest or someone who really could not care less about you. The hospitality industry is unique in its ability to truly transform a person’s mood and enhance a guest’s experience. From the mint left on a pillow by a maid, to the delightful conversation with a waiter, to the counsel given by a bartender, when the right people are in the right jobs, hospitality can be taken to a whole new level. Let’s take a look at the type of people who were simply made for Hospitality. Those who go into Hospitality often go into it because they have a knack for enhancing the experience for customers. The industry is not for the light-hearted due to its fast pace and, at times, demanding needs. Those who generally succeed in this industry are able to adapt to these challenges, however, it becomes apparent quite quickly to spot those who do not fit the bill. Many people can remember the person who was working alongside them just to have a job, and it was evident that customer service really is not their true passion. Hospitality calls for those who have a servant’s heart, love to see others happy, have excellent professionalism, and stellar attention to detail. These people are addicted to the customer experience and stop at nothing at brightening the day of those they serve. Anything short of this negatively affects a company’s bottom-line with unhappy customers and diminishing profits. The beauty of hospitality is in its variety. There are many ways to provide hospitality and no shortage of demand for it. It is also true hospitality jobs are found just about everywhere on the planet. Although perhaps not all-inclusive, some forms of hospitality include Hotels, Restaurants, Cruises, Casinos, Country Clubs, Food Service, Retirement Community, Travel/Tourism and Conference Events. Below, let’s delve into some examples within each category. When you think of any city in any state, what do they have in common? Hotels! Everywhere needs a place where people can come and stay during their visit. Although service and hospitality are at the core of hotels, there are many kinds of jobs that make a hotel run. Typical jobs may include Bellhop, Maid, General Manager, Front Desk Attendant, Valet, Catering Manager, Cook, Bartender, Waiter/Waitress, Maintenance, and many more. Would you like any fries with that? There are few things more rewarding than being able to serve food for hungry customers starving for nutrition after a long day. Although if waiting on hungry hippos is not your cup of tea, there are other opportunities counseling regulars as a bartender, or running the backbone of a restaurant in the kitchen. Typical jobs may include Waiter/Waitress, Chef (and the many varieties thereof), Host, Busboy, General Manager, Catering Manager, Bartender, and others. If you feel up to the challenge, you may be a fit. Jobs may include Security, Dealers (of all kinds), Pit Boss, Surveillance officers, Cashiers, Waiters/Waitresses, Bartender, Catering Manager, in addition to many other varieties. Cruises – the ultimate all-inclusive getaway that is becoming more and more popular in today’s vacationing market. Feel like getting away for a weekend to Alaska? There is a cruise for you. Feel like going to the Caribbean for a week while your friends are cold in Minnesota during the winter? There is a cruise for you. Cruises are great opportunities to get away from the mundane life and live a little bit. Cruises are growing in popularity partly because of their robust attraction and entertainment venues, not to mention their insane value and simplicity. Basically, it is becoming increasingly possible to do the same things on a boat as on land! Because of all the options that are becoming available, Cruises are hiring Magicians, Actors, Translators, Mechanical engineers, Lifeguards, Food Service Workers, Waiters/Waitresses, Bartenders, Chefs, Managers, Boat Captains, Boat Crew, and more! Fore! For those who enjoy the finer things in life, the country club provides a relaxing getaway. Whether it is 18 holes of golf, a game of tennis, or a day at the spa, a country club makes your comfort its top priority. Nowhere else will you get the chance to serve and interact with the elite of your community. Common opportunities include Golf Instructor, Waiter/Waitress, Bartender, Event planner, Chef, Catering Manager, Tennis Coach, and Masseuse. Big Mac please….Food Service is often forgotten in hospitality, but nonetheless a great start for anyone looking to get into hospitality. With a focus on food cleanliness and amazing customer service, those in Food Service can provide on-the-go nutrition for customers with busy schedules. Food Service jobs may include Cashier, Grillmaster, Drive-Thru Cashier, Busboy, General Manager, and Waiters/Waitresses. Some of the most amazing moments in life happen at conferences. They provide an opportunity to reflect on past experiences, and set a new direction for the future. Conferences also are educational and help you grow professionally or provide an opportunity to connect with like-minded people. Many people do not recognize the work that happens in the background of such events. Conferences require many hands to be successful including Executive Director, Technical Engineers, Registration Coordinators, and of course Speakers. What could be more rewarding than getting the chance to enhance the quality of life for those in their golden years? Unfortunately, as we get older, we tend to need more help with even the basic things of life. Although someone who is getting older does not need someone to do completely everything, having a community to be a part of substantially increases one’s quality of life. Retirement Communities require Nurses, Event Coordinators, Administrative workers, Food Service, a Cleaning Crew and Maintenance technicians. Similarly to a cruise, those looking to travel are looking to break away from their chains and see the world. Unfortunately, travel can be exhausting, stressful and chaotic in its own right. Fortunately, however, there are people who can help make this more enjoyable. Whether it is flying by plane and having a great Steward/Stewardess or by Train and having a friendly conductor, traveling can be enhanced drastically. Other jobs related to travel and tourism included tour guides, travel agents, and even cab drivers. Hospitality is a diverse industry, as one can see from the breadth of jobs listed above. However, each of them have one thing in common – they are dedicated toward the service of others. It is completely not about you, but about the guest. If you share this mindset, try one out for size by doing an internship or job shadowing. At the very least, you can go experience the fruit of these jobs firsthand by going to a restaurant and interviewing the Waiter, or maybe a hotel and building a connection with the General Manager. 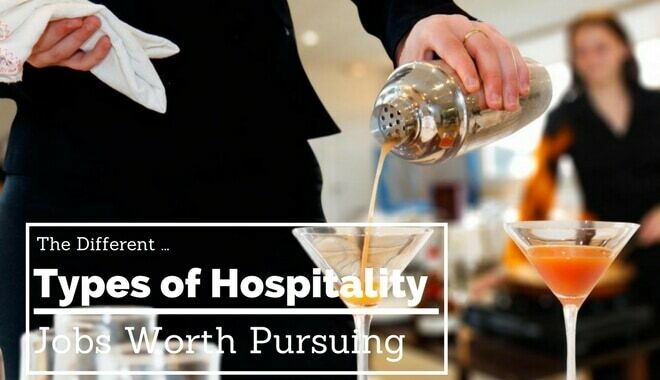 In doing this, you will experience what the job entails and what qualities make or break someone’s career in Hospitality.